The main purpose of the Garden City Farm is the production of essential oils from Brazilian plants. Among the many plants studied over the years, the Brazilian Cherry (Pitanga) was the ultimate finalist and now occupies a prominent position on the farm. More than 25,000 trees of Brazilian Cherry can be found in the field, and tens of thousands of seedlings are being cared in the farm´s nurseries . The Brazilian Cherry fruit is the largest known fruit source of vitamin A in nature, which translates into a strong antioxidant activity. The essential oil, distilled from the leaves, provides the unique aroma, and it´s intense anti -inflammatory property. 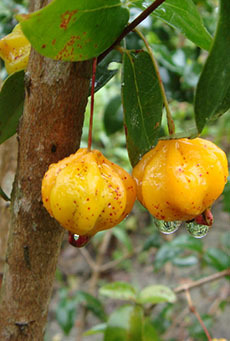 The fruits are edible, together with their strong reddish color and unique flavor makes them highly appreciated in Brazil.